Many large and small scale conservation projects require permits from a number of local, State, and even Federal agencies. When planning a project on their land, landowners and land managers often wonder when a permit may be required. 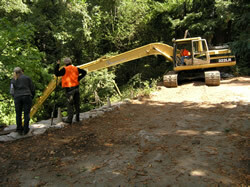 Working in or near a waterway, riparian area, or wetland. Working in any area where endangered species may be affected. Navigating the permit process can be costly, confusing, frustrating, and time consuming. The RCD has expertise in securing the permits landowners may need before starting work. The RCD can help landowners secure required permits, including permits issued by the County of Santa Cruz, the California Department of Fish and Wildlife, the US Environmental Protection Agency, the Regional Water Quality Control Board, the Army Corps of Engineers and the California Coastal Commission. In addition to providing technical assistance with securing permits, the RCD has a “Permit Coordination” program that streamlines the permitting process for 15 different types of conservation projects that meet certain guidelines and specifications and may speed the process and substantially decrease the cost for some projects. Funding may be available to assist landowners who are interested in permit assistance.